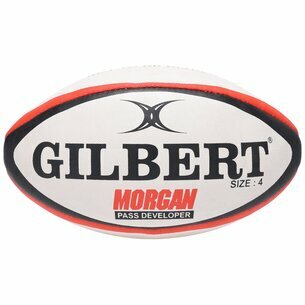 Made by Gilbert, the Morgan Pass Developer Rugby Ball is an overweight ball used to develop wrist strength and passing distance. Black and red tones wrap themselves around the seams and sit aside white panels, upon which the black Gilbert branding is sported over opposing sides. Although this ball will benefit your game, it should be noted that it weighs 1kg and has been created specifically for pass development training and not to be used for kicking.